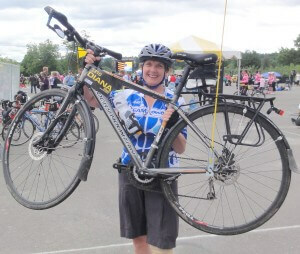 Thank you for your Support of my Ride to Conquer Cancer! Our Penny Drive was a huge success and a lot of fun as well! We helped a lot of people clean up their desk drawers, overflowing coin dishes and pickle jars. The copper (and a fair amount of silver) coins more than half-filled the water jug. The sheer weight of the jug made it a challenge to lift! Speaking about the weight … at weigh-in on Friday morning, it was a whopping 79.4 lbs. (36 kg. for those of you who are younger or converted)! Claire Sutton’s guess of 60 lbs. was the closest. She won a $50 gift certificate to the Pink Lime Spa in Yaletown for a bit of pampering! When it came to doing the count, although Diane was anxious and willing to have the fun job of rolling the coins, we took the easy way out. With the kind assistance of Terry Tan, Bank Manager of the Oakridge Branch of the Bank of Montreal, we used their coin-counting machine without a service fee. This made it a speedy task, although there was the challenge of lugging the heavy jug in and out of the car and into the mall. I thank my husband, Doug, for the use of his muscle! And thank you again, Terry, for allowing us to create a fair amount of noise and commotion in your Branch on Friday morning! 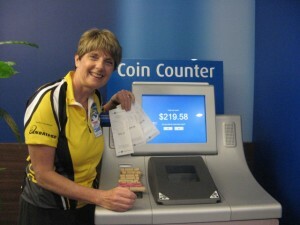 By the time the last penny tinkled through the machine, the reading was: $369.42! We are happy to present Michael Danyluk with a $50 gift certificate to Monk McQueen’s Seafood and Oyster Bar in False Creek for his guess of $335 … the closest without going over. Congratulations to Claire and Michael! Everyone’s generosity was overwhelming! Even when we were at the BMO branch using the coin-counting machine, customers in the line-up were donating their coin as well! 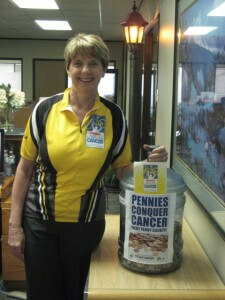 Funding cancer research through the BC Cancer Foundation is such a worthwhile cause! Thank you again! Congratulations Diana! You did it!